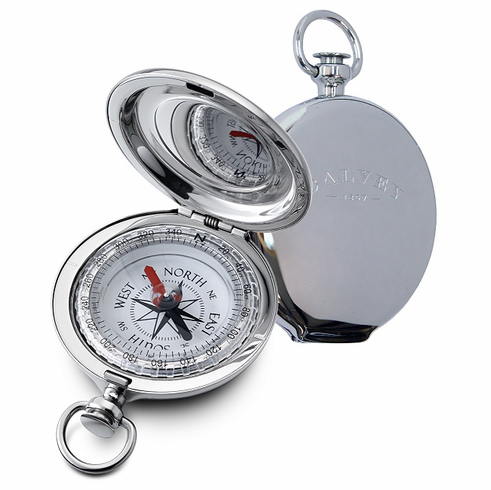 This new pocket compass from Dalvey has a smoother front face and a perfectly smooth back side, to combine for many engraving area possibilities. The liquid filled capsule features a tungsten steel needle on a jeweled bearing. Around the capsule is a rotating azimuth ring with 5 degree resolution. The capsule is set in a precision made, non-tarnish stainless steel body. The highly polished stainless lid features an engraving area below the Dalvey logo, and folds into a pocket-watch style fob. The back side of the compass features a smooth polished surface suitable for engraving an entire message or phrase.